If Hillary Clinton activated her "firewall" in the past week of presidential primaries, black women are a key component of it. Black voters voted overwhelmingly for Clinton in Democratic primaries across the nine states where race data is available, and the proportion of black women casting ballots for Clinton was even greater than the proportion of black men, based on exit polls reporting race by gender data. 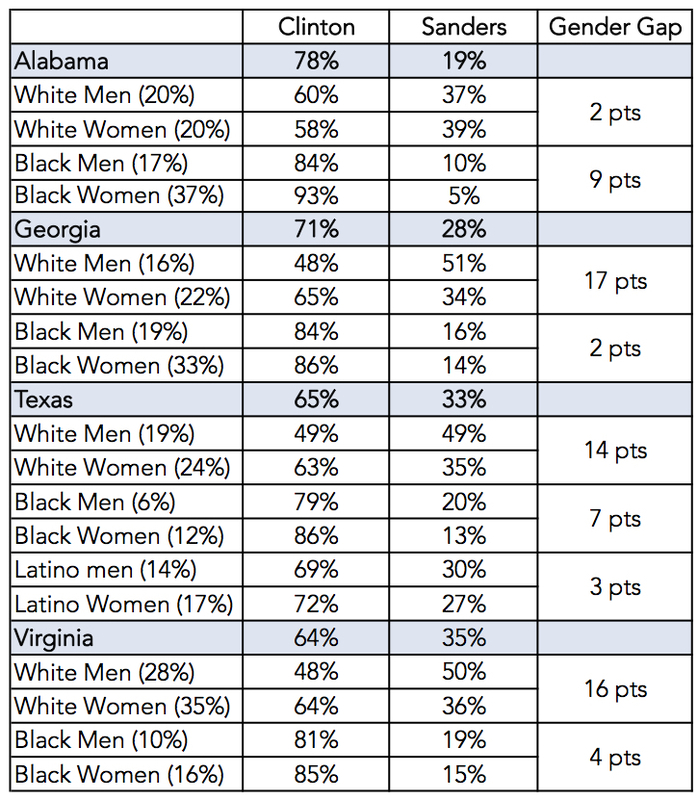 Gender gaps--the difference between women's and men's support for the winning candidates--range from two to nine points among black voters in primaries in Alabama, Georgia, South Carolina, Texas, and Virginia. Most significantly, Clinton has won more than 85 percent of black women's votes in each of these states. 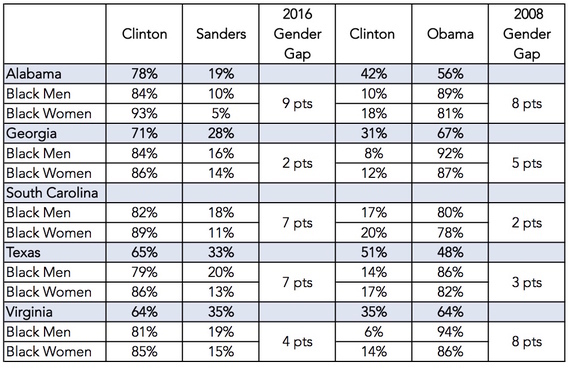 Clinton's support among black women voters is even more significant since they have turned out at the highest rates of any race/gender subgroup in the past two presidential elections. More than 70 percent of black women voted in 2012, out-voting white women (65.6 percent), white men (62.6 percent), and black men (61.4 percent). 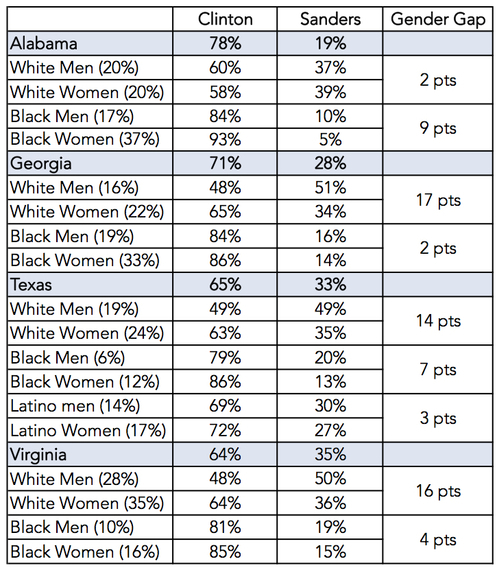 Based on the available exit poll data from the Democratic primaries in 2016, black women continue to make up a larger proportion of the Democratic electorate than black men. 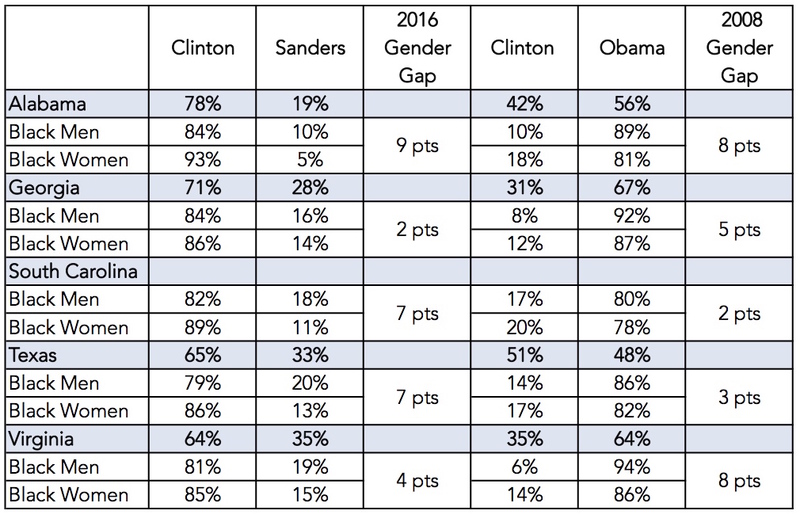 Despite the dominance of support for Clinton, black women voters are not monolithic. Generational, ideological, and regional differences--among others--influence the policy priorities and perspectives of black women voters, as do the experiences they bring to--and value most at--the ballot box. Too often, the strong majorities in black women's support for any given candidate yield conclusions that their votes come en masse, making it all too easy for their influence to be overlooked and their support to be taken for granted. That risk is particularly great as we move on to the general election. In 2008 and 2012, 96 percent of black women voters cast their ballots for Barack Obama. Regardless of which Democrat wins the nomination this year, there is no indication that black women--or black voters overall--will shift their allegiance to the Republican party. But even if that assumption of Democratic loyalty is true, there is no guarantee that enthusiasm, engagement, and turnout will match that which proved so valuable to Obama's election and re-election. Already, the overall turnout numbers in the Democratic primaries are lower than those in 2008, while turnout on the Republican side is exceeding 2008 numbers by significant margins. The mobilization of voters in the primary and general election will matter when it comes to who votes on Election Day. Black women's voices have figured prominently in recent weeks on the Democratic primary campaign trail. Five black mothers of slain children traveled across states with Hillary Clinton, while former Ohio State Senator Nina Turner and legal scholar Michelle Alexander have publicly supported Sanders and questioned Clinton's commitment to black America. Will these voices, and the conversations in which they are engaged, continue beyond primaries in demographically-rich states for black voters? Even more importantly, how do black women voters ensure that these conversations continue and deepen to yield substantive policy plans and positions to which any Democratic nominee can be held accountable? Black women's voices need to be heard and addressed in the remaining primary debates and beyond when nominees are selected in July. Harnessing the power of black women's votes means leveraging enthusiasm in advance and boosting turnout in November to ensure that candidates feel compelled to address the issues of greatest importance to black women on the campaign trail and in office. Importantly, black women don't just mobilize themselves; they organize their communities and bring others to the polls with them.